Halal Mediterranean restaurant and pizzeria in Norbury. 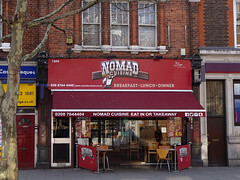 It was previously called Cafe Nomad photo, but changed its name to Nomad Cuisine by Spring 2019. They also do takeaway but possibly not delivery. The front part seats 28 people in a space decorated with Middle Eastern art photo, and there's a back room which can seat around 24 more. bob visited on a Sunday lunchtime in July 2016. There were only three other people in when I arrived around 1:15pm, and I was invited to sit wherever I liked. A starter of calamari al romana (£4.45) photo was cooked competently, and came with a nicely garlicky mayonnaise. Mixed grill (£13 including chips) photo arrived on a sizzler plate. The steak was overcooked to my liking, but still juicy. The sausages were not good quality, but picked up a lot of flavour from their grilling and the other things on the sizzler plate. The chicken breast had a nice char and was well-marinaded in piri-piri sauce, but the chicken wings could have been slightly more charred. The lamb chops were fine. The onions at the bottom of the platter had caramelised nicely. The chips photo were dusted with chilli powder and served with ketchup. Flatbread (£1.20) photo arrived warm, in a basket. No service charge was added to the bill photo. Accessibility: A step to get in. Once you're in, it's level to the toilets with just a small ridge at the threshold. Last visited by bob, July 2016. Last edited 2019-03-30 18:02:50 (version 2; diff). List all versions. Page last edited 2019-03-30 18:02:50 (version 2).